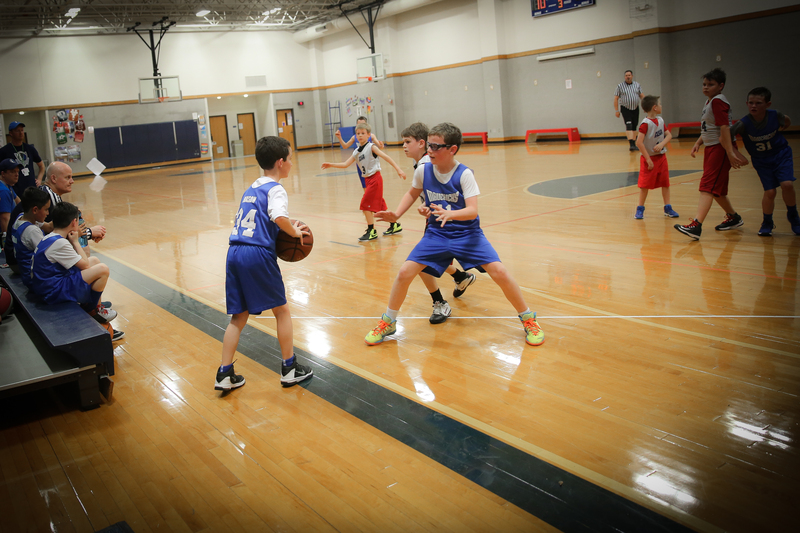 I found a great article about which lenses are best for shooting indoor sports – such as my son’s basketball games! The most challenging pictures I have taken! For many seasons, I followed my kids around at their soccer and baseball games taking pictures with my Canon 5-D Mark III. I got pretty good at taking action shots of them playing their outdoor sports. However, I was forced out of my outdoor, wonderful light comfort zone when my son decided he wanted to play basketball! My first thought was “But wait…the lighting in a gym is terrible. How will I ever get decent pictures of him playing?” It has proven to be more difficult than I thought it would be, and I am continuing to try to learn more about taking indoor sports pictures. 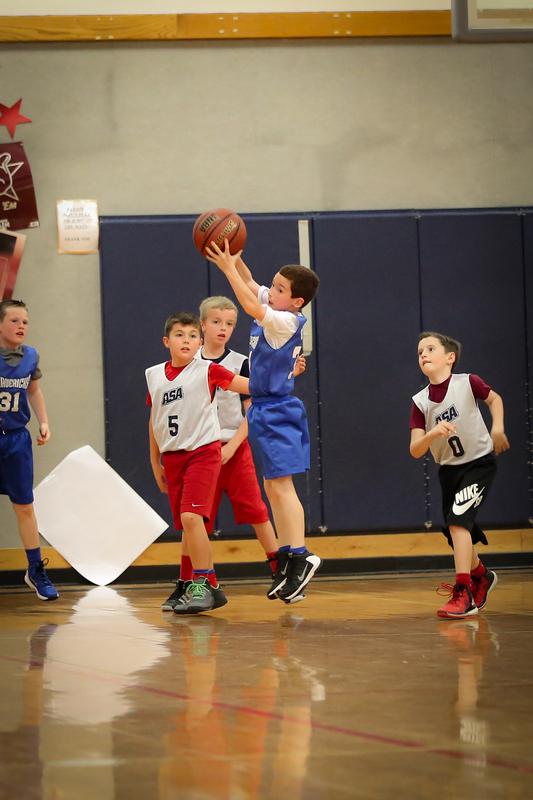 Now that basketball season is over for us (at least until summer leagues start), I thought I would share some of what I learned…which isn’t a lot! The thing I learned right out of the gate was that basketball is a very fast sport, and you have to be very fast to get a good action shot. It took me the first several games to get good at following #34 with my camera. Unlike baseball, you can’t really predict in which direction they will run. And of course with soccer, the field is huge, the light is great, and it was always easy for me to find Morgan chasing down the soccer ball heading towards the goal. Basketball just wasn’t the same. Lots of kids running very fast back and forth, twisting and turning, passing the ball, and jumping up to take shots! It was crazy for me! I first started taking pictures with my Canon EF 70-200mm f/2.8L IS II USM Lens. It was great as long as I could get far enough away from the court so that I could see more than one person in the frame. In a gym, that proved to be difficult at times, and many of my shots have just #34 in them. But…some of the pictures turned out pretty good. 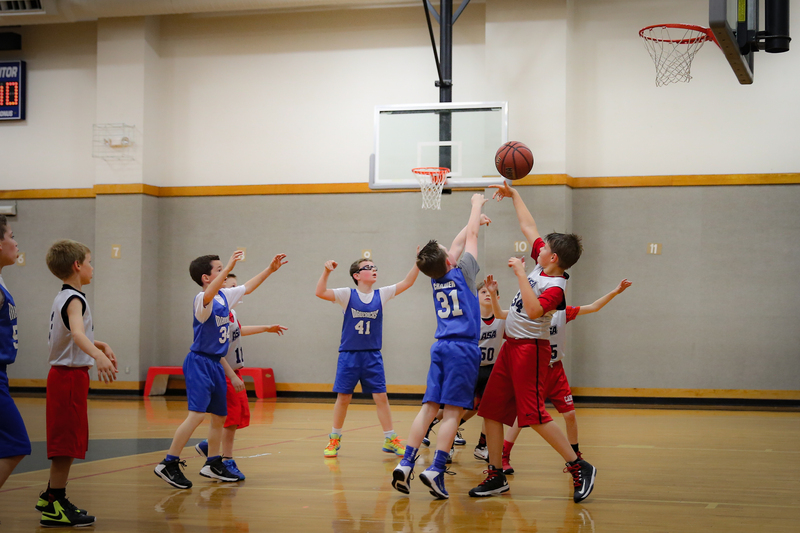 I’d always known that the 70-200 lens was the best for sports – the pictures are crystal clear and so sharp. I love this lens. But I still wasn’t pleased with the pictures I was getting at the basketball games. I wanted to see more of the court and the other players in my pictures. I also wanted pictures that showed the ball in the air going towards the hoop! 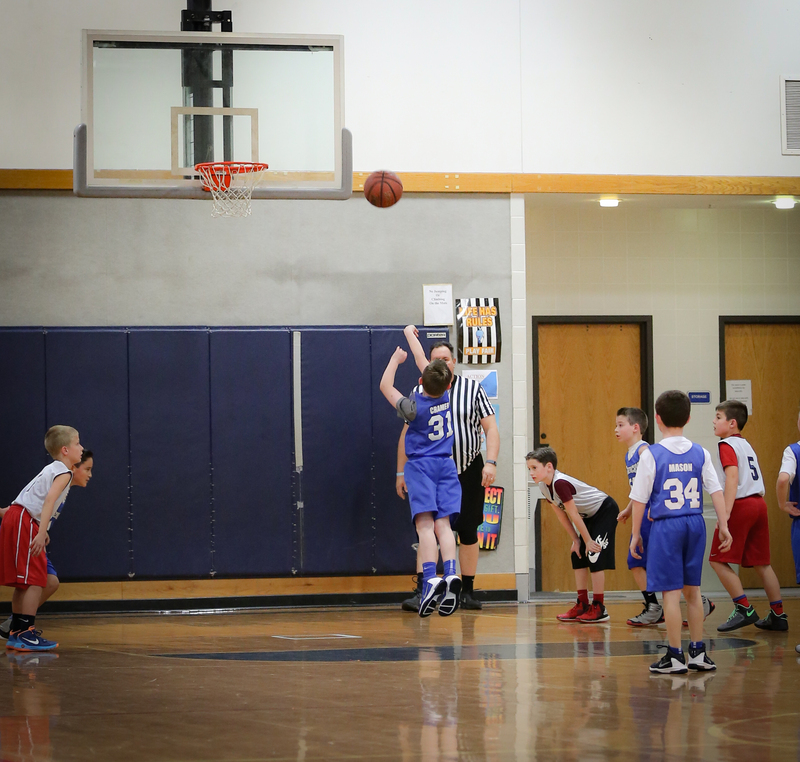 I took several pictures of my son taking shots from the free-throw line. The pictures from the free-throw line taken with the 70-200 lens only show Zach and the basketball. You couldn’t always see other players in the shot. I decided after reading the attached article, that I needed to try my Canon EF 24-70mm f/2.8L II USM Lens so I could capture Zach and the basketball goal, as well as some of the other players. I was actually surprised that the 24-70 lens was listed as one of the top lenses for indoor sports. I knew it was a good lens that took crisp pictures, but just had not thought of it as a sports lens. Mostly because I thought I needed more zoom! 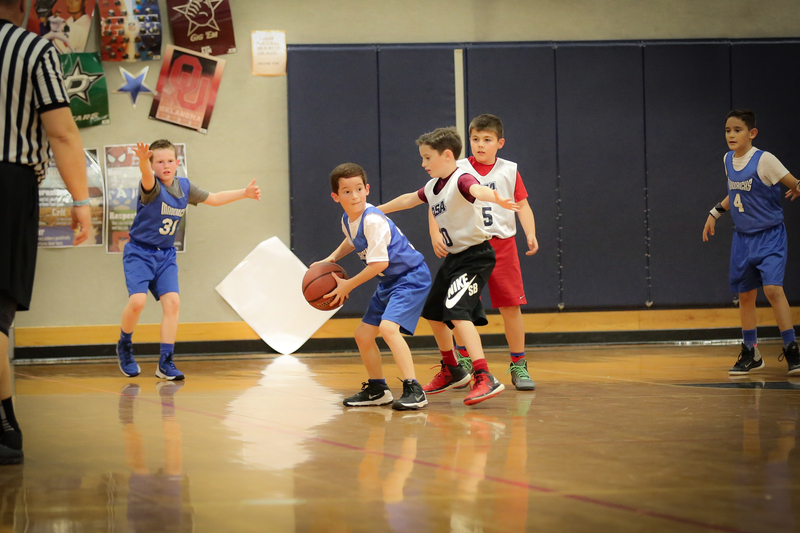 Typically, when using my 70-200, I would just sit in the bleachers at one end of the gym and take shots mostly of Zach down at the opposite end of the basketball court. That allowed me to zoom in just on Zach, or zoom back out and see more of the court – the basket and the other players. When they came back down to the end I where I was sitting, I was really only able to get shots that were pretty close up. That’s what led me to try the 24-70. Now I’ve discovered that for basketball games, I really need to travel with both lenses. That way I can get pictures of Zach when he’s shooting at the opposite end of the gym with my zoom lens, and then switch to my short lens when he’s shooting down near where I’m sitting in the bleachers – – always on the end so I can hop up when I need to quickly move to the floor to get a good shot! The two pictures below were taken with my Canon EF 24-70mm f/2.8L II USM Lens. In order to get some fun angles and be closer to the action, I took these shots from down on the floor. I was very close to where the kids were playing. But because I was using my short lens, I was still able to capture all the action around the kid I was focused on. I was very pleased with the pictures I shot with this lens. They were very sharp, and the lens had no trouble focusing on the quickly moving images! The two pictures below are taken with my Canon EF 70-200mm f/2.8L IS II USM Lens. In both of the pictures shown, the kids were at the opposite end of the gym from where I was sitting, so even with the large zoom, I was still able to show the basketball goal, as well as some of the other players. Had they been at the same end I was, that would not have been possible as it was in the pictures taken with the 24-70. Now…ready for the Pop Quiz?? Look at the two pictures below… Which picture was taken with the 70-200, and which picture was taken with the 24-70? Or…am I playing a trick on you, and they were both taken with the same lens? Can you tell a difference?? When I was shooting with my 24-70 lens, the camera was set to Shutter Speed Priority (Tv on a Canon), the Aperture setting was f/2.8, and I was using the Auto ISO setting. In the pictures I posted, the ISO usually fell between 2500 and 3200. The Shutter Speed was set at 1/250. When I was shooting with the 70-200 lens, the camera was also set to Shutter Speed Priority (Tv), the Aperture setting was always between f/2.8-3.2, and the Auto ISO fell between 3200 and 6400. The Shutter Speed was set at 1/250 . 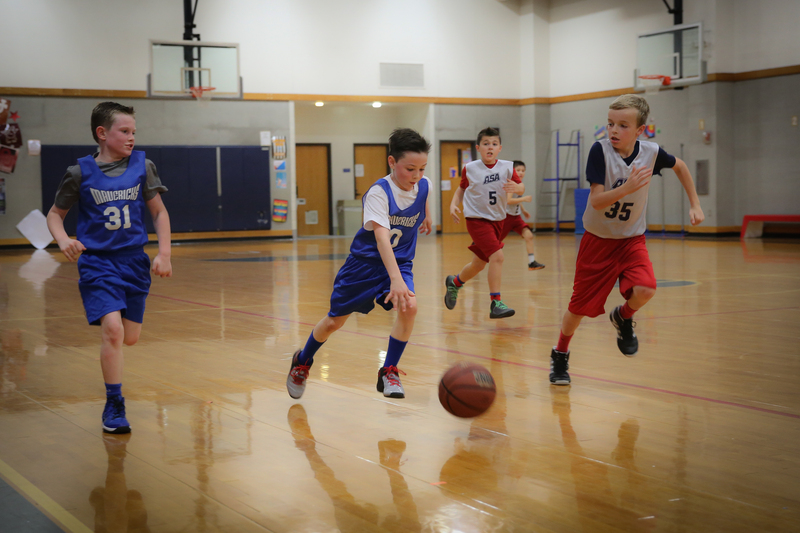 In both cases, I was trying to freeze movement, so I set the Shutter Speed to a very fast setting – – I needed the slowest speed that I could use without blurring the image (especially the basketball). In this particular game, Shutter Speed was 1/250. But…this meant I needed more light, so I set the Aperture wide open at f/2.8 in order to get as much light in as possible! Also…with my Canon 5D Mark III, I am able to use very high ISO settings without making the pictures grainy. I was not able to do this when I was shooting with the Canon 60D. If you find some settings that work better, please let me know!! So there you have it! As you can see, I still have not mastered taking basketball pictures yet, but I do learn something new each time I shoot. I try to anyway. It’s a learning process. And I’ve learned enough for this season. Ready to return to my happy place – the baseball field and the soccer field with nice, bright, outdoor light! Until next time…get out and take some pictures!! Which Tripod Do I Need? The Manfrotto Tripod!! Yes…I have the team pictures and will be doing something with them soon! Stay tuned… Did you like what I did last year? Maybe something like that again? ?